According to a new report released by Project Tomorrow, more educators in non-traditional classrooms indicated that, thanks to technology, "they are now providing students with more individualized attention, creating more student-centered learning experiences, helping my students become self-directed learners," and 53 percent said the use of tech "results in students taking greater ownership of their own learning," compared with about a third of educators in traditional classrooms. "The opportunities technology presents to transform learning have yet to be fully explored and implemented in classrooms across the country," said Julie Evans, CEO of Project Tomorrow, in a statement released to coincide with the report. "Speak Up data continues to show evidence of external indicators of change, but also indicate the lack of real systematic changes in activities, attitudes or aspirations of teachers. 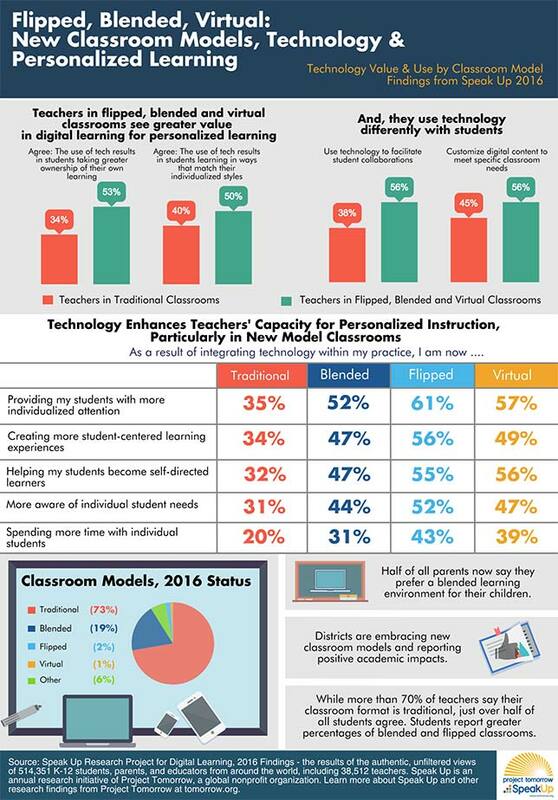 Those teaching in new classroom models — flipped, blended and virtual — are pointing the way for how technology can actually change teaching and learning." Further information can be found at tomorrow.org/speakup.